Throughout the life, one needs a guiding light which help to show the path of righteousness amidst the tension and pressure of office work where precision and timeline are the critical factors of performance. The dilemma is how to maintain that balance between personal and professional life, keep the mind steady and be peaceful. On a daily basis, the mood swings and imbalance keeps on creating. To discuss these issues and finding the terse solutions of the same, DJJS was invited to be part of the seminar organized at Vadodara, Gujarat. Divya Jyoti Jagrati Sansthan (DJJS), a socio-spiritual organization is leading and providing the path of righteousness. A done day seminar / workshop were organized in the office of the Principal Commissioner of Central Excise, Customs and Service Tax, Vadodara, Gujarat on February 10, 2016. 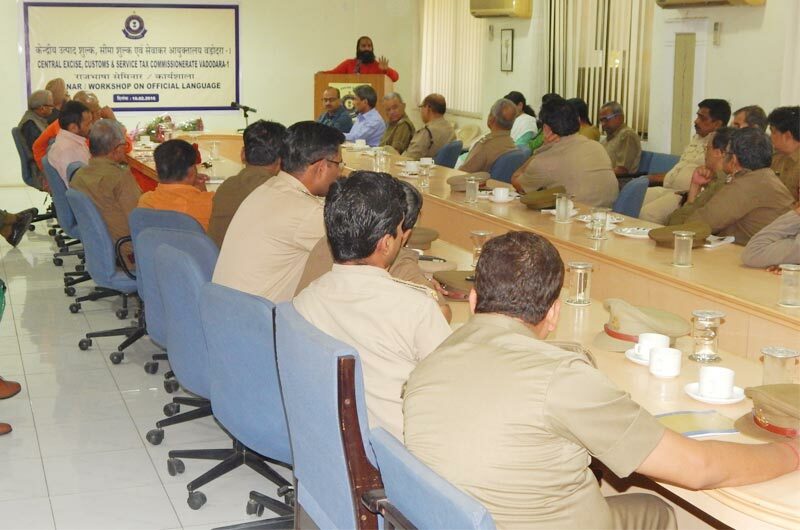 The theme of the seminar was ‘Stress management and use of Hindi language in official environment’. 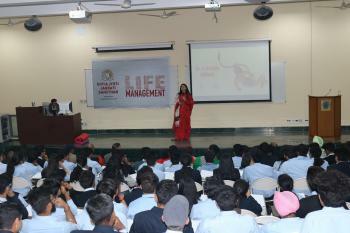 Vadodara branch of DJJS were special invitees to be a speaker at the seminar. The main orator of the lecture was Swami Amaranand Ji, preacher and disciple of Shri Ashutosh Maharaj Ji aegis under whose guidance DJJS and the humanity is flourishing and getting a new lease of life. The preacher hit the nail on the head by dwelling into the burning topics like Stress Management, Personality Development and Positive thinking. The importance and need to use Hindi language as the official language of work were also discussed. The preacher orated that if we look closely; all these topics are targeted towards “I” while we keep blaming “Others” all the time for any problem in our life. So need of the hour is to introspect and work on the self so that a balanced life can be lead. This balance can be created only when one knows the purpose of life and be connected to the source of that purpose just the way a mobile is charged when connected to the source of power. So to transform self, one needs to remain connected with the divine power. Just the way, regular charging lengthens the life of battery and handset, regular divine vibrations help to enlighten and improve the quality of life. He stressed upon the fact that these are not mere words but it can be practiced. 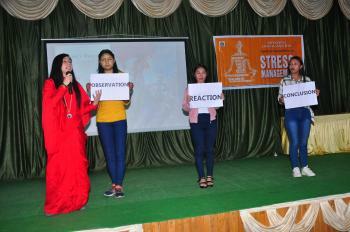 The stress can be managed, if not alleviated, using the technique of Brahm Gyan based meditation. It helps oneself to remain connected with SELF with the help of which concentration, positivity and moral values fall in place. Life becomes more disciplined and carefree. In official environment also, one can remain fully connected with divine source and create the balance between peers, subordinates and superiors. A number of officers and employees attended and appreciated the lecture. DJJS preachers were honoured by the Chief Commissioner, Mr. Arvind Singh. DJJS wishes that people introspect and apply the solution prescribed rather than just listening to it because real benefits can be realized only then.